An award-winning high-tech micro engineering company continuing to grow its global presence after locating in Teesside is the 7,000th business to secure an investment from UK Steel Enterprise. A £100,000 second investment from UK Steel Enterprise is enabling Micropore Technologies, based in Redcar’s Wilton Centre, to ‘complete the jigsaw’ of taking its unique membrane emulsification process through from laboratory to full scale manufacture with the launch of two new systems. Micropore Technologies recently won the 2018 NEPIC Award for Innovation. Its unique process uses a sieve type membrane to engineer droplets and particles to a uniform size and the benefits that brings to manufacturers of products from food and medicine to cosmetics and even rocket fuel means it leads the field. It now has a presence in the USA, India and South Korea. 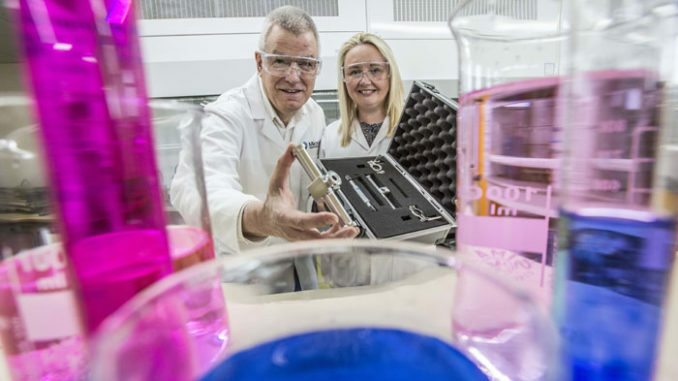 CEO Dai Hayward – pictured (above) with UKSE’s area manager Sarah Thorpe – said: “We have now launched twin systems that are capable of continuous manufacture of high quality emulsions in industrial quantities and this is a real breakthrough as traditional homogenisers cannot touch the performance of our products. “This is the final piece of the jigsaw to take the process from the initial laboratory stage to full scale manufacture. “The first investment from UK Steel Enterprise came at a vital time for the company and this second tranche will help us move ahead strongly in our existing sectors and open up new ones,” he added. Managing director Simon Hamilton said: “It is good to see a high-tech specialist company that is leading the way in its field become the 7000th business we have helped. Micropore Technologies had its beginnings as a spin-out from Loughborough University’s chemical engineering group but re-located to Teesside for the strength of the formulation knowledge base and supply chain, available skills, calibre of investors and quality of premises. It now has a growing team of seven. “We are growing strongly in the USA through our sales office there,” said Dai Hayward. “A recent visit to India has resulted in a contract for a pharma application as well as valuable new contacts with return visits to the UK being planned. Sarah Thorpe, UKSE’s area manager, added: “Micropore Technologies is a highly innovative company with a very experienced management team.